This is the second in my series taking about superhero characters. In my kickoff post I explained how in some ways they are the modern Gods – created in our image to put into stories to help us understand ourselves better. This time I’m looking at Batman, the broody anti-hero without any powers. The only son of wealthy parents, young Bruce Wayne is scarred forever when he witnesses his parents gunned down in front of his eyes. He dedicates his life to perfecting himself physically and mentally, forging himself into a foe who will stand in the way of criminals and keep them from devouring society. Searching for something to help him inspire fear in the cowardly and the unjust, Bruce takes inspiration from the dark image of a bat. 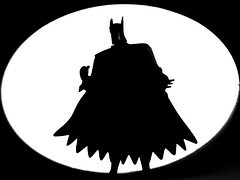 Now the World’s Greatest Detective, the Batman prowls the streets of Gotham City with his mind, his muscle, and his endless array of gadgets, defending the innocent from the evil forces of the night. Batman is a normal human being who has mastered himself and walks with the Gods. A regular person who through discipline, focus, and patience became someone all the other heroes admire and respect. Batman is the ultimate in physical human perfection. He never gets exhausted scaling the tallest of buildings, and has muscle definition that would send Spartans back to the gym feeling flabby. If a martial art ever comes up, he’s mastered it. Swimming? Fencing? Gymnastics? Olympic level skills across the board. Not content to by the ultra-jock, Batman is also a genius level scientist and engineer. One of his original titles was “World’s Greatest Detective“, and one story has him studying from Sherlock Holmes himself. He is always three steps ahead of not just his foes but also his fellow heroes, and the devices in his magical bag of holding utility belt are rarely not up to correcting the task at hand. In spite of all the training, time, and effort needed to be the Batman, he also manages to maintain himself as a multi-Billionare in his spare time. Both mentally and physically, Batman is everything we imagine we could be if we just started working hard rather than sitting around on the internet all day. Yet it is the emotional aspect of Batman that cements him as an icon. His obsession over his parent’s death turned him dark, relentless, and more than a little crazy. Yet he doesn’t kill. In most versions, he refuses to use a gun at all. He inflicts terror and fear on the cowardly underbelly of society, yet does it through some of the highest moral avenues. In some ways he has mastered the most dangerous of human emotions and turned them into a powerful tool. Whereas I think Superman is somewhat limited in his storytelling options, Batman’s humanity and challenges make him an incredible character. We’ve already seen him mentor several Robins, struggle with loneliness, and grapple with the deep paranoia that fuels his world. He’s been everything from campy to psychotic, and from Miller’s classic Dark Knight Returns about an aged and broken Batman, to Nolan’s brilliant The Dark Knight about Batman facing his own moral impact upon the world, there is no shortage of new ways to explore his facets. I’d even argue that it is the richness of the Batman character that gave rise to one of the greatest comic book villains: the Joker. Comic villains are often defined in opposition to the heroes they face, like the intellectual Lex Luthor to the mighty Superman, and the Joker was born out of funhouse mirror reflection of Batman’s own psychosis and obsessions. Like Batman, the Joker has been endlessly redefined. He’s grown from a goofy clown, to a drowning psychopath in The Killing Joke, to Heath Ledger’s raging anarchist. In the DC Universe it is said that when the other super-Villains want to scare each other they tell Joker stories. Only the greatest of characters could give birth to one of the greatest of villains. Little kids reading comics can never hope to grow up to fly like Superman, or climb walls like Spider-Man, but there is a little voice in the back of their head that tells them that if they really worked hard enough they could be Batman. Great job, Jeff! I’ve never thought about superheroes this much, but it makes a lot of sense. I look forward to your next article. .-= adamvonwillis´s last blog ..02-08 Back in the Saddle Again =-. Let’s not forget the plain old Badass Factor. Superman, with all his god-like powers, is kind of a goody-two-shoes. Batman wears a lot of black and kicks people in the face a lot. Sure he’s in the grip of psychotic rage but he looks cool. Well…maybe not the Batusi.